The 4-H meetings that I remember from my younger days don't look any different from the ones that I've been attending with Emma the past few months. 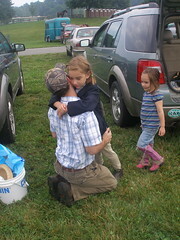 Now, officially a "clover" (a young 4-Her) I'm getting to relive my 4-H days with her. And who knows, maybe she'll follow in her mother (and aunt's) royal footsteps and some day wear the county fair queen's crown. ha. Every meeting begins with the 4-H pledge, which I still remember thank you very much, and then we move on to the old and new business. So in the spirit of a good 4-H meeting, shall we begin? I pledge my head to clearer thinking, my heart to greater loyalty, my hands to larger service and my health to better living. For my club, my community, my country and my world. Is there any old business? Why, yes. Yes there is. 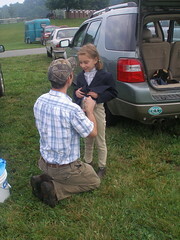 Last Thursday sweet Emma rode in her first horse show. 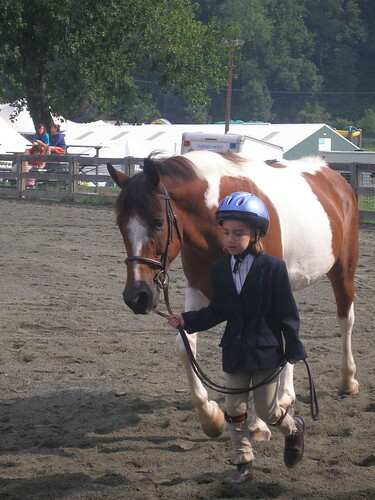 It was hot, there was lots of waiting and entertaining of an antsy toddler, but it was worth every drip of sweat trickling down my cleavage to see my little girl decked out in her fanciest of riding apparel, parading a Paint pony around the ring. There's nothing like watching your little girl in her first horse show to make you feel like she's growing up too fast. My goodness. Aside from coming home with three shiny green rosettes, a bucket full of treats, brushes and teeshirts from our local feed store, one of the best parts of the day(for me) was watching Emma push herself and experience success. She was nervous about the first showmanship class and kept coming to me with her pleading, "Mommy, I don't want to do this. I'm trying to be brave and not cry in front of all these people, but I really don't want to do this" eyes. But I knew, we all knew, that she could do it. It wouldn't be anything more than she could handle and the whole thing would be a good experience. If she'd just get in there and try. 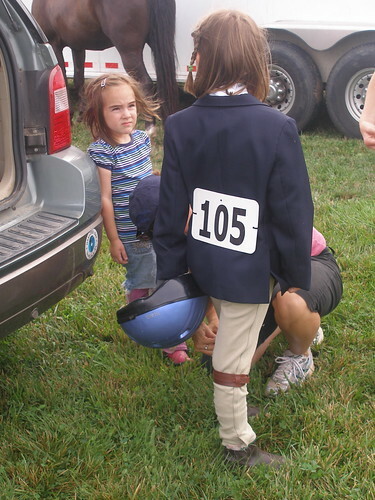 Sensing her hesitation, the lady who trailered the horses to the show swooped Emma up, gave her a pep talk and sent her into the ring–with a tactic that would have been much different from my own. She did it all with kindness and Emma's best interests in mind–but her approach was different. As I walked behind her and Emma and listened to them talk, my nurturing side wanted to rescue her from the situation. I didn't want her to have to do something she didn't feel comfortable with or that she thought would be too hard. But I kept it to myself. Dan was walking beside me and must have been sensing my unspoken desire to come in and rescue her: "This is good for her." he said.� "It's good for her to learn from another person besides you" And then he said something else profound about the key to confidence is to conquer something you're afraid of, or nervous about. That man. I need to get a moleskine for his back pocket, too. But everything he said was true. I didn't come to the rescue. I didn't jump in and save her from a slightly uncomfortable situation. I stood back and watched–for I had more confidence in her, than she had in herself, at the moment. And did she fail? Absolutely not. The girl set her jaw, marched into the ring and showed her heart out. She emerged from it all, beaming, proud, ready for more and of course, sporting a large green rosette. And I think the first words out of her mouth: "When do I go in again?" …..I"ll save the new business for tomorrow. 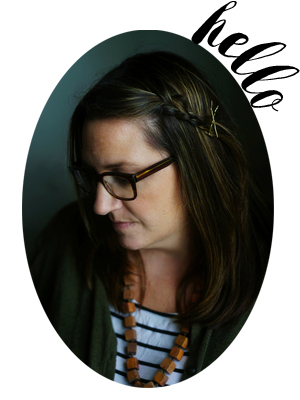 New Bushel and a Peck posts here and here, if you please. A ridiculous amount of pictures in the whole Farm Fair set, here. As well as some amazing diving dogs, the chicken lady, my favorite cow, and Emma's ethusiastic head cheerleader. YOU GO GIRL!!! Oh I’m just so proud of that little lady! My Luke is thinking of joining 4H too. He’s definitely the kind of kid (like his mama) who really does NOT want to be the center of attention, but I think it will be a good stretch for him too. You’d better tell me though, just what did that lady say that got her in the ring. I might have to write it down in my own Moleskin! Good girls, both mama and daughter!!! What a great fun experience! Yay! I’m so glad it went well. I remember moments like that as a kid, and even as an adult, for that matter, when, once it’s done, you feel supremely better about yourself and the whole thing you were afraid of in the first place. Congratulations on the “new business” Miss Thang. It looked great! Yea for Emma! 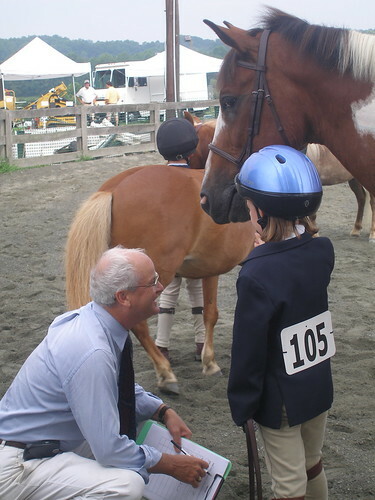 I remember my own 4H horse shows – some of the best moments of my childhood. I hope my daughter can have the same experience also. Brings back lots of memories – thanks for sharing and congrats to Emma. So glad it went well. It sounds like she said the same thing my niece said after her first lead-line show. It is definitely tough letting another teach our children especially when it may be a bit different than our approach. That’s so funny that you still remember the motto! I can still recite the girl scout pledge by heart, some 21 years later! It will be fun for you to relive it all! Congratulations to Emma and to her supportive Mummy! Another former 4H-er here. You guys are so supportive! And Emma will be so glad to have these photos when she’s all grown. 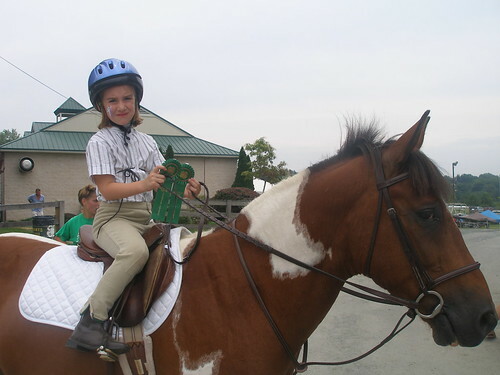 I used to be in the 4-H Horse club growing up too. Didn’t the pledge used to say “and my God” at the end? My middle dd, is a horseback rider…I well remember getting everything ready for the ring. She rode dressage and cross country and the horse required as much coiffing as the rider. Those ribbons will go a long way to boost her confidence. Like Mother like daughter. This is a beautiful post. Heartfelt and courageous on everyones part. It is wonderful to accept the fact that other adults have so much to offer our children. A. It helps us not have to shoulder it all and B. Others gracing our lives is truly grace. good on you Emma! and green rosettes too! congratulations. And what a beautiful horse you have. Those times when you have to step back or want to but can’t step in and protect them, they are heart-wrenching. She does look so grown up! Sometimes just watching them grow is the hardest part. I just love your new banner. man! If we only would have known she was showing on Thursday. We went on Saturday and randomly saw some kids showing goats. it was the cutest thing. Hooray for Emma! Way to go sweetie!